This is the story of the building and homeward-bound maiden voyage of Horizon, a Chris White Atlantic 48 high-performance cruising catamaran. Philip and Kristin Zhivago had the boat built in Cape Town, South Africa, then sailed it home to Jamestown, RI, from April to June, 2009. Kristin blogged as they traveled across the southern and northern Atlantic oceans. They went 8,000 miles, and only stopped once during their 2-month trek. This site contains those posts, starting at the beginning of their journey. Hi. We are currently at S 26 degrees, 32 minutes and E 6 degrees, 36 minutes, still on our way to St Helena. We figure it will end up taking us 11 days to get there, from Cape Town. We are about halfway there. The wind is now holding steady at about 10-15 knots, which is very nice for sailing. The water is jewel blue, a deep blue color I have never seen before. It’s beautiful. Today we put up the “Code Zero” sail, which is a very big sail that attaches to the end of the bowsprit, with the other end – the “clew” – going almost halfway back on the boat. The Code Zero has the added advantage of shading the pilothouse from the afternoon sun – something we will appreciate when we get to warmer areas. As it is, it is a very pleasant 70ish degrees here. Without the Code Zero, in this amount of wind, the boat was sailing along at about 4 knots. Now it’s sailing along at 7 knots. So there is a definite speed advantage to putting up the Code Zero. Too bad it isn’t so easy! I’m sure we’ll get used to it, but this was our first time. 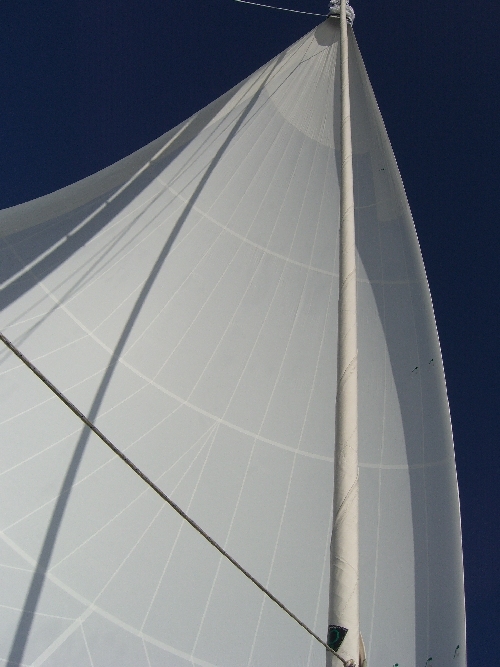 In this picture, you can see the “sock” at the very top of the sail. When it’s time to put the sail away, we pull the sock down using lines attached to the plastic hoop at the bottom of the sock. The sail goes into the sock, and the whole thing goes into the port forepeak, through a big hatch on the deck. 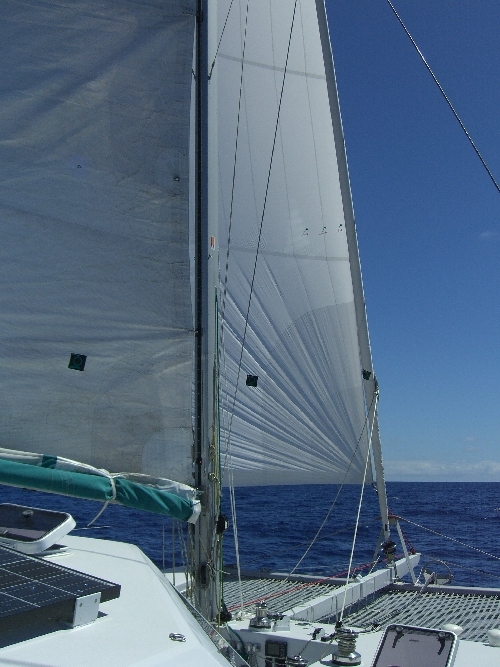 Here’s a shot of the mainsail and the Code Zero, which is attached to the end of the bowsprit. Getting it up was a struggle. One lesson: Don’t let the sail wrap around the jib, which is rolled up close by (attached to a fitting further aft on the bowsprit). Easy to do, not good when it happens. It also turns out the line we had attached to the clew of the sail – the end that goes along side and to the rear of the boat – was attached improperly. It took a while to get everything “sorted,” as they say in South Africa, but it’s up now and the boat is happy. The autopilot has been amazing. We have not steered the boat at all since Tuesday. You set your course, and the autopilot steers the boat, using data it gets from the wind meter at the top of the mast, and the compass setting. It’s the right way to do long ocean crossings. The stars at night would blow your mind. You can see the entire Milky Way, and zillions of stars. Venus (I think it’s Venus) is so bright in the wee hours that it creates a reflective pathway on the water, just like the moon. We have only seen one other ship since the other day. Mostly we are completely alone. The song “Just the Two of Us” keeps playing in my head. 🙂 Everything is getting pretty salty; I’m hoping for some rain so I can do some washing up. I seem to be past the seasickness phase, and with the boat gliding along so smoothly, cooking is a joy again. So far, so good. Even Matthew’s garden is doing well, although during our wild ride the first three days, I’m sure those little plants were wondering when the earthquake was going to end! We hope this finds you all well and we send our love. Pleasant memories of our loved ones are definitely with us on this journey, every minute of each day.